Saxelby Cheesemongers Sweet & Savory Hearts Selection! Orders can be placed for pick up at Saxelby Cheesemongers or to be shipped the week of Valentine’s Day. To place an order, click here. They say that opposites attract. We here at Saxelby Cheesemongers couldn’t agree more! Whether you root for the sweet or for the savory, we’ve got your cupids covered this Valentine’s Day. 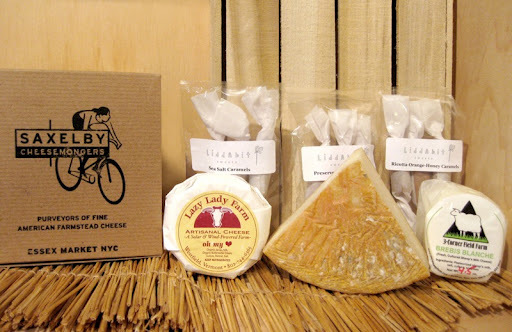 Our Sweet & Savory Hearts selection includes three fine farmstead cheeses and three varieties of caramels from the unparalleled Brooklyn confectioner, Liddabit Sweets. Don’t know what to give your sweetie this year? Don’t despair! Nothing says love quite like dessert. Each selection comes packed up in a little box bedecked with Valentines’ accoutrements. O’ My Heart is just what it sounds like, a rich buttery cheese that’ll make your heart race. Match that milky goodness up with some sweet caramel studded with bursts of sea salt granules and you’ll need a second bite! The clouds cupid sits on aren’t as light and fluffy as this incredible sheeps’ milk cheese! Made upstate New York, Brebis Blanche is light and refreshing, with a decidedly citrusy finish. The subtle flavors of orange and honey combine to make a harmonious flavor helix in your mouth. A sweet, malty, musky goat cheese is the perfect mate for this unusual and delicious caramel! The bright lemony zest and the spicy richness of olive oil in the caramel ping pong off the goats’ milk flavors in a most delightful way. It may just leave you dizzy. Till next week, be in love, eat cheese, and be merry! And if you’re jonesing for more cheese in your life, tune in to Cutting the Curd on Heritage Radio Network. This past Sunday, Steve Jenkins and I dish about American cheese (not the orange stuff) and get a call from a Massachusetts monger!